Baseball is doing very well financially, but it has several off-field issues it needs to improve upon. Chief among them is the PED issue that continues to stain the game. This week, SPORTS ILLUSTRATED senior writer Tom Verducci, who has covered baseball for more than 30 years, is assessing the state of the game and suggesting some possible improvements. On Wednesday, he explained why baseball is facing a frightening future and why a shorter schedule makes sense. On Thursday, he offered seven potential improvements for the on-field product. Today, he looks at ways baseball can improve itself with off-field changes. With negotiations toward a collective bargaining agreement underway, the challenges for baseball in its healthy economic climate are to strengthen its national cultural relevance and to cultivate more young fans. Here are six ways MLB can make a positive impact off the field. Just last week, Posey told me that he would be in favor of stronger penalties, including a one-and-done policy, as long as protections were in place against “accidental” positive tests. Such protection already exists, with a three-person arbitration panel in place to hear grievances. Following Olympic guidelines, players who flunk PED tests should be thrown out of baseball for a minimum of two years (especially because science shows that the benefits of PED use can carry beyond baseball’s 80-game penalty for a first offense). A second offense carries a lifetime ban. Worried about “accidental” positives? That’s why the Olympics have the Court of Arbitration for Sport. Tell it to the judges. Drugs aren’t going away, as evidenced by the players who have been busted for PEDs this year, such as Marlins second baseman Dee Gordon, who just returned from his 80-game suspension on Thursday night. There's too much money at stake. And stiffer penalties won’t make the game entirely clean. But most PED use is intentional, covert and calculated to defeat testing and sportsmanship. Baseball currently has too much tolerance for such miscreants. 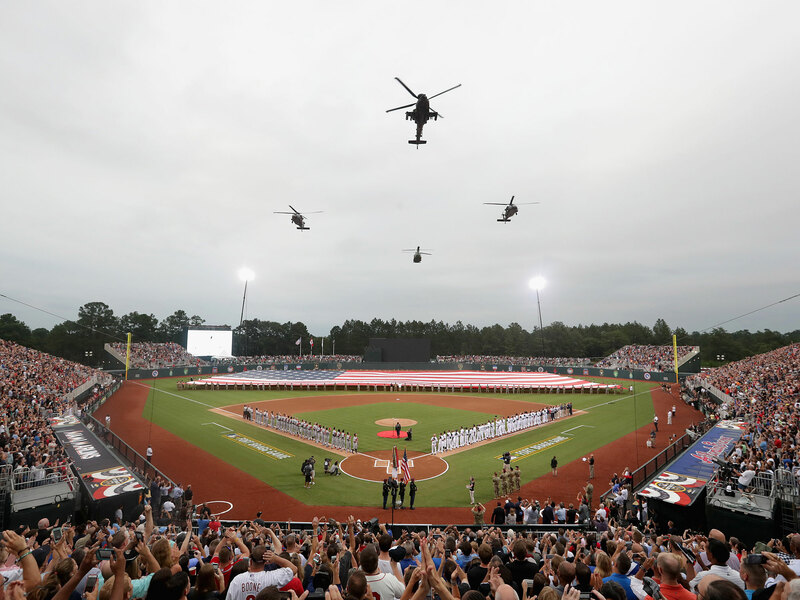 On July 3, the Braves and the Marlins played a regularly scheduled game at Fort Bragg in North Carolina, the first time a major professional sporting event had ever been played on an active military base. It was great for the sport, but it competed against 14 other games that day. Baseball really only has the American team sports calendar to itself from late June, when the NBA and NHL finals conclude, to the end of July, when NFL training camps begin. It forfeits much of that by going dark for two nights after the All-Star Game in mid-July. Baseball should seize that opportunity, as well as the chance to create a true “event” feel in a schedule with more than 2,000 games, by playing one game on the Thursday after the All-Star Game in a non-traditional MLB venue. Think of the Tigers against the Blue Jays at the Big House in Ann Arbor, Mich.; the Phillies against the Pirates at University Park, Pa.; the Twins against the Brewers near the Black Hills of South Dakota; the Cubs against the Cardinals on the Field of Dreams in Iowa; the Mets against the Phillies at tiny, historic Doubleday Field in Cooperstown, N.Y. You get the idea. Let towns bid on hosting the annual game. In 1991, the NCAA cut the maximum available baseball scholarships per school from 13 to 11.7. (Not all schools are even fully funded at that modest level.) There is no indication it is ever going back up—not without help from MLB. With only 11.7 scholarships available, few college baseball players get a full ride, as the money often is divided in fractions among players. This is not the case in football and basketball, where the elite players can count on a full ride. When the few players talented enough to play multiple sports face a decision about which sport to pursue in college, the lack of full rides in baseball puts it at a disadvantage. MLB did engage in preliminary talks with the NCAA four years ago about some funding of scholarships, but the talks did not advance far. Control is an issue. If MLB is investing money in college players, it would want a strong voice in how NCAA baseball is administered. The majority of first-round picks and the majority of six-year major leaguers come from college programs. Investing in college baseball is an investment by MLB into attracting the best athletes to the sport. About 25% to 30% of all tickets go unsold. Baseball’s own research reveals that the sooner you expose a child to the experience of attending a major league game, the more likely that child will become a baseball fan for life. Baseball needs to encourage not only youth participation but also attendance at games. MLB should heavily emphasize youth attendance in April and May, traditionally the least attended months and also the time when youth leagues are ramping up. Baseball already does a good job in this area. A story told to me by Mets rookie outfielder Brandon Nimmo reinforced the impact major league personnel have on children with simple acts. Nimmo said he became hooked on the idea of playing major league baseball when he attended a Rockies game and the bullpen catcher flipped a baseball to him. Players and clubs need to be aware that even the simplest acts of outreach and kindness can create an enormously powerful and lasting connection between fans and the game. Keeping baseball, its unique ballparks and its players accessible—especially in a tangible way—is one of baseball’s advantages over most sports. The Red Sox, for instance, have opened Fenway Park on Father’s Day to allow dads to have a catch with their son or daughter. Travel baseball, with its expenses and hyper-organization, breeds an elitist image for the game, so MLB smartly launched a “Play Ball” campaign to promote pickup versions of baseball. Now MLB needs to go a step further and facilitate such play with capital investments. Baseball, more than other sports, traditionally has relied on fathers to introduce and teach the game to the next generation. Anybody who heard the Hall of Fame induction speeches of Ken Griffey Jr. and Mike Piazza last weekend understood the real and emotional power of this dynamic. But since 1960, the percentage of children growing up without a father in the house has more than doubled, from about 11% to estimates that range from 24% to 33%. Baseball should tap into its army of former professional players to serve as cultivators of the game on a neighborhood basis. In parks and playgrounds throughout the country, these cultivators would stock a storage shed with basics of the game—bats, balls and bases—and supervise Saturday or Sunday morning pickup games. No uniforms, no standings, no administration, and modified rules designed for faster play, such as the Hit-and-Run version baseball has tested to positive feedback in some youth tournaments in which the ball is constantly in play with little standing around (i.e., no pickoff throws allowed; leads are limited by a chalk line; a batter is out upon the first called strike; etc.). The sweet spot here is learning how to play the game while having fun.